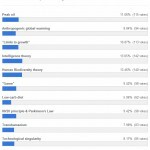 The vast majority agree with Peak Oil, Limits to Growth, Intelligence Theory, and Human Biodiversity. The first three are not surprising, as they have been covered extensively since the blog’s inception, but I am somewhat surprised about the popularity of HBD – after all, I’m only an (open) convert to it fairly recently. Slightly fewer agree with the precepts of AGW, Game, and 80/20 principle & Parkinson’s Law. Again, this is fairly surprising to me. After all, AGW is socially accepted nowadays; the exceptions are easier to list (e.g. American conservatives), whereas Peak Oil and Limits to Growth are still very controversial concepts with opponents from both sides of the ideological spectrum. “Game” gets an impressively good showing, though this kinda makes sense – it is almost intractably linked with HBD, since by accepting fundamental race differences, doing likewise for gender is a no-brainer. The 80/20 Principle & Parkinson’s Law is admittedly vague, but in essence it is meant to encapsulate the arguments contained within Tim Ferriss’ The Four Hour Workweek, i.e. that there are structural reasons for why organizations and their employees are very inefficient, and that there exist ways for committed individuals to break that cycle through shortcuts like “muses” (location-independent revenue streams) and geoarbitrage. I highly recommend readers look into these theories because just as with Game for dudes, they have the potential to massively improve life quality. Only very modest support is voiced for Transhumanism and Technological Singularity, and understandable thing because (1) few people are deeply aware of them, even committed netizens, and (2) they are in ostensible contradiction to core AK themes like Limits to Growth and Peak Oil. But there is no contradiction. My longstanding view has been that IF global civilization manages to avoid collapse or severe degradation in the dangerous mid-century period, when pressures from energy shortages and climate change are likely to heat their peak, then transformative technological change is very likely to occur based on reasonable projections from current trends. Lifespan has already been successfully multiplied by several factors in laboratory mice by genetic tinkering, and it is surely only a matter of time before it these methods can be upscaled to large mammals including humans. Technological singularity is a more iffy possibility, despite Ray Kurzweil’s best attempts to argue for its imminent inevitability, but regardless I am of the opinion that the mind can be simulated on silicon substrates, that “mind uploading” is theoretically possible and may be achievable in practice sooner rather than later because of the exponential nature of growth of computing power, and that even if these exotic possibilities don’t materialize this century it may not be that big of an issue thanks to massively extended longevity. Low carb diets (paleo, caveman) have by far the lowest approval rating. So I should definitely write a bit more on that. I think the arguments of their proponents are logical, humans simply have not had time to evolve to eat complex grains let alone have them constitute the bulk of their diet. Doing so leads to obesity, diabetes, and a host of other chronic ailments that plight rich country populations. As such I think the standard “food pyramid” advice peddled by nutritionists is bunk and even criminal taking into account the mounting evidence against it. Are You A Social Contrarian?